We love tacos. The great thing about tacos is that you can add any ingredient you like. 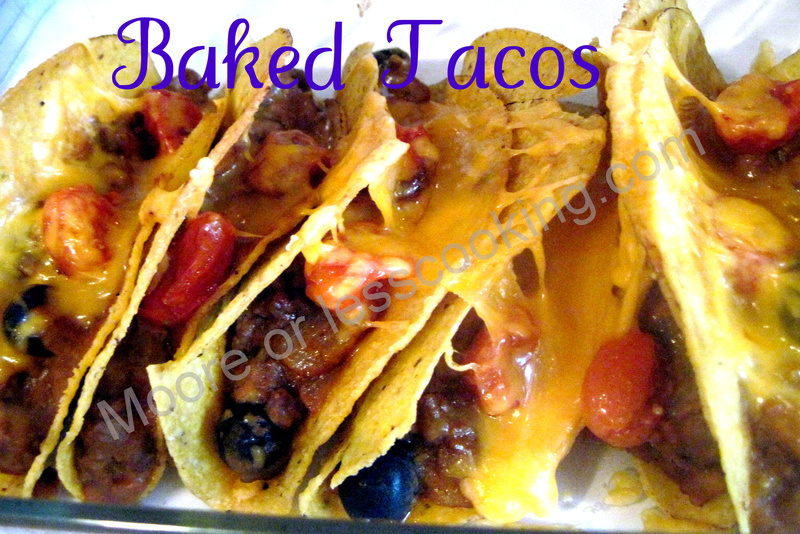 This taco recipe is the basic recipe using ground beef, beans, onions, tomatoes and cheese. These made 12 tacos, using corn tortilla shells. You can always substitute, ground chicken or ground turkey for the beef. In a large skillet, heat oil and add onion and garlic – saute for about 5 minutes until soft. Add beef and taco seasoning, cooking until meat is browned. Add beans and salsa. Mix well and let cook for a couple of minutes so that the flavors can meld and the mixture can thicken. In a large 9×13″ baking pan, line up all the taco shells. Fill each one with a couple of scoops of the beef mixture and pack down into the shell. Repeat until all the shells are filled. Add olives and tomatoes.Top each taco with shredded cheese. Bake for 8-10 minutes (or until all the cheese is melted). Serve with your favorite taco toppings (tomatoes, lettuce, olives, sour cream, guacamole, pico de gallo , hot sauce, or whatever you like!). Makes 4-6 servings (depending on how many tacos each person wants! ).